Batman Detective Comics #669 CGC 9.4! White Pages! (DC 1993) Brand New Slab NM! Detective Comics #669 Knightquest The Crusade Joker Cameo DC Comics 1993 VF!! 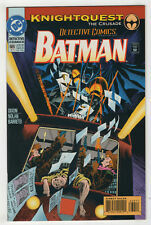 DETECTIVE COMICS # 669 - - DC 1993 (fn-vf) KnightQuest: The Crusade. Detective Comics#669 Incredible Condition 9.4(1993)”Knight Quest” Nolan Art!! DC Comics Detective Comics #669 Modern Age. This page was last updated: 21-Apr 00:17. Number of bids and bid amounts may be slightly out of date. See each listing for international shipping options and costs.